Optical clearing techniques are revolutionizing the way tissues are visualized. In this report we describe modifications of the original Clear Lipid-exchanged Acrylamide-hybridized Rigid Imaging-compatible Tissue-hYdrogel (CLARITY) protocol that yields more consistent and less expensive results. Roberts, D. G., Johnsonbaugh, H. B., Spence, R. D., MacKenzie-Graham, A. Optical Clearing of the Mouse Central Nervous System Using Passive CLARITY. J. Vis. Exp. (112), e54025, doi:10.3791/54025 (2016). Traditionally, tissue visualization has required that the tissue of interest be serially sectioned and imaged, subjecting each tissue section to unique non-linear deformations, dramatically hampering one's ability to evaluate cellular morphology, distribution and connectivity in the central nervous system (CNS). However, optical clearing techniques are changing the way tissues are visualized. These approaches permit one to probe deeply into intact organ preparations, providing tremendous insight into the structural organization of tissues in health and disease. Techniques such as Clear Lipid-exchanged Acrylamide-hybridized Rigid Imaging-compatible Tissue-hYdrogel (CLARITY) achieve this goal by providing a matrix that binds important biomolecules while permitting light-scattering lipids to freely diffuse out. Lipid removal, followed by refractive index matching, renders the tissue transparent and readily imaged in 3 dimensions (3D). Nevertheless, the electrophoretic tissue clearing (ETC) used in the original CLARITY protocol can be challenging to implement successfully and the use of a proprietary refraction index matching solution makes it expensive to use the technique routinely. This report demonstrates the implementation of a simple and inexpensive optical clearing protocol that combines passive CLARITY for improved tissue integrity and 2,2′-thiodiethanol (TDE), a previously described refractive index matching solution. The ability to image complete neuroanatomical structures is immensely valuable for understanding the brain in health and disease. Traditionally, 3D imaging has required tissue sectioning to provide the axial resolution and to visualize deep anatomical structures. This approach can produce high-resolution data sets, but requires sophisticated image reconstruction techniques and is very labor intensive. As a result, it has been limited to the imaging of small volumes of tissue1-3. Optical sectioning, on the other hand, is well suited for the creation of high-resolution 3D images of fluorescently labeled tissues. Since optical sectioning is inherently three dimensional, it does not require extensive computation to produce a 3D image volume. However, light scattering and tissue opacity limit the depth at which tissues can be optically sectioned. The depth of imaging is limited to about 150 µm in laser scanning confocal microscopy and to less than 800 µm using two-photon excitation microscopy4-8. In order to overcome these limitations, several optical clearing techniques have been recently developed and then further refined to permit the deep microscopic imaging of intact tissues. The use of benzyl alcohol and benzyl benzoate (BABB) to render fixed tissues transparent was among one of the earliest approaches9. However, this approach was limited by the quenching of fluorescence in the samples and incomplete clearing of highly myelinated structures10. Refinements of this technique, such as 3D Imaging of Solvent Cleared Organs (3DISCO), have led to very rapid and complete tissue clearing, but still suffer from rapid loss of fluorescent signals, especially yellow fluorescent protein (YFP)10. 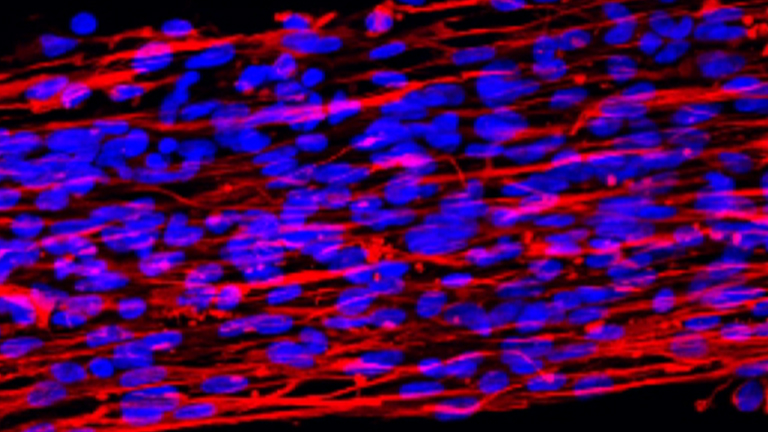 Water-based clearing solutions, such as Sca/e11 and SeeDB12, preserve fluorescent signals, but do not completely clear highly myelinated tissues. Clear, Unobstructed Brain Imaging Cocktails and Computational analysis (CUBIC) is a promising new optical clearing technology that appears to overcome the limitations of previously developed water-based clearing solutions13. In contrast with other optical clearing techniques, Clear Lipid-exchanged Acrylamide-hybridized Rigid Imaging-compatible Tissue-hYdrogel (CLARITY)14 embeds the brain in a porous matrix that provides structural integrity to proteins, nucleic acids and small molecules, while leaving lipids unbound. The lipids are then removed electrophoretically, culminating in an optically cleared brain that can be easily visualized and equally easily probed using commonly available techniques. Electrophoretic tissue clearing (ETC) is used to remove lipids from hydrogel embedded tissues in CLARITY, however, ETC can be difficult to implement consistently and tissues subject to electrophoresis can exhibit tissue distortion, browning, loss of fluorescence and antibody reactivity. Passive lipid clearing avoids these limitations, but requires increased clearing times15-17. Passive clearing also permits the clearing of large numbers of samples in parallel, since it is not limited by the number of ETC apparatuses available. Decreasing the concentration of paraformaldehyde and excluding bis-acrylamide from the hydrogel have led to great increases in the speed of clearing at the expense of greater tissue expansion16. Less expensive alternatives to the refractive index matching solution used in the original CLARITY technique have been developed17-19. 2,2'-thiodiethanol (TDE) is an inexpensive and rapid brain clearing agent that reverses some of the tissue expansion that occurs during lipid removal18. This report incorporates passive clearing of hydrogel embedded tissue and the use of TDE as a refractive index matching solution to the original CLARITY technique to produce a highly reproducible and inexpensive protocol for the optical clearing of the mouse central nervous system. All experiments were performed in accordance with Institutional Animal Care and Use Committee (IACUC) guidelines. THY1-YFP, PLP-EGFP and PV-TdTomato mice were used for these experiments, but any mice expressing fluorescent proteins can be successfully cleared and imaged. Caution: Paraformaldehyde (PFA) and acrylamide are toxic and irritants. Perform experiments utilizing these reagents in a fume hood and with appropriate personal protective equipment (lab coat, gloves, and eye protection). Sacrifice the animal in euthanasia chamber with ~1 ml of isoflurane until breathing ceases (~2 - 3 min). Use a peristaltic pump set to ~5 ml/min to intracardially perfuse the mouse with perfusion solution (Table 1) at 4 °C until the blood is cleared from the tissues (5 - 10 min). Change the perfusate to fixative solution (Table 1) at 4 °C until the neck and tail have significantly stiffened (5 - 10 min). End the perfusion and decapitate the animal. Carefully dissect out the brain from the skull by first removing the connective tissue surrounding the skull and then removing bone from the ventral surface of the skull and lifting the brain out (Figure 1a), as described in 20. Note: Give special care to the removal of bone surrounding the flocculonodular lobes of the cerebellum and the olfactory bulbs. Dissect the spinal cord from the vertebral column by gently inserting the tip of a fine, sharp scissor between the spinal cord and the vertebral column and cutting the individual vertebral column segments away, as described in 21. Hemisect the brain by placing it in a plastic mouse brain matrix and cutting along the midline with a matrix blade. Add each hemisphere and spinal cord to separate 50 ml centrifuge tubes with ~40 ml of hydrogel solution (Table 1). From this point forward cover the tubes with aluminum foil to protect the fluorophores during all subsequent steps. Incubate the tube containing the sample in hydrogel at 4 °C with gentle shaking (~30 rpm) for 7 days. Discard ~25 ml of hydrogel, preserving the sample and ~25 ml of hydrogel in the centrifuge tube. Deoxygenate the sample by removing the cap and placing the centrifuge tube in desiccator jar and connecting the jar to a vacuum. Apply the vacuum for at least 10 min to permit dissolved gases to come out of solution and form bubbles. Gently shake to dislodge the bubbles. Replace the vacuum in the desiccator jar with 100% nitrogen gas over 2 - 3 min. Once the pressure equalizes (once the top of the desiccator jar can be opened), quickly cap the tube to prevent the reintroduction of oxygen. Polymerize the hydrogel by placing the tube with sample in a 37 °C water bath for 3 hr until polymerization is complete. Polymerized hydrogel will take on a gel-like consistency (Figure 1b). Note: A small amount of unpolymerized hydrogel at the top is acceptable. Use a spatula to remove the polymerized sample from the centrifuge tube, then cut away the excess hydrogel from the sample. Remove the remaining hydrogel by placing the sample on a lint free wipe and gently rubbing and rolling the tissue on it, leaving behind only a thin layer of polymerized hydrogel on the sample. Note: Lipid-cleared tissue is fragile, handle with care. Use a cell strainer when draining the tube to avoid losing sample. Also, the sample will swell throughout the clearing process, however, swelling can be reversed during the refractive index matching process. Caution: Sodium dodecyl sulfate (SDS) and boric acid are irritants. Perform experiments utilizing them in a fume hood and with appropriate personal protective equipment (lab coat, gloves and eye protection). Transfer polymerized sample to a clean 50 ml centrifuge tube and add 45 ml of clearing buffer (Table 1). Incubate at 45 °C with gentle shaking (~30 rpm). Change the buffer daily for an initial 7 days by pouring off the used clearing buffer into chemical waste and adding ~45 ml of fresh clearing buffer. Keep the centrifuge tubes containing the samples covered in aluminum foil to protect the fluorophores. After the initial 7 days, incubate the sample at 40 °C and exchange clearing buffer every 2 - 3 days. Continue clearing until all lipids are solubilized and tissue reaches transparency (Figure 1c). This will be 4 - 6 weeks for a mouse brain hemisphere and 2 - 4 weeks for a spinal cord. Once tissue is cleared, transfer sample to a new 50 ml centrifuge tube and wash 4 times in PBST (Table 1) at 40 °C with gentle shaking (~30 rpm) over 24 hr to remove residual SDS. Caution: 4',6-Diamidino-2-Phenylindole Dihydrochloride (DAPI) is an irritant and any experiments utilizing it should be performed in a fume hood and with appropriate personal protective equipment (lab coat, gloves, and eye protection). Transfer the sample to a clean 15 ml centrifuge tube and fill with 1 µg/ml DAPI in 1x PBST, pH 7.5. Incubate at room temperature (RT) for 24 hr. Keep the centrifuge tubes containing the samples covered in aluminum foil to protect the fluorophores. Wash 3 times in PBST at RT for at least 6 hr/wash. Caution: 2,2′-Thiodiethanol (TDE) is an irritant and any experiments utilizing it should be performed in a fume hood and with appropriate personal protective equipment (lab coat, gloves, and eye protection). Transfer the sample to a clean 15 ml centrifuge tube and fill with 30% (v/v) TDE in 1x PBS, pH 7.5. Incubate at 40 °C with gentle shaking (~30 rpm) for 24 hr. Exchange 30% TDE with 63% (v/v) TDE in 1x PBS, pH 7.5. Incubate at 40 °C with gentle shaking for 24 hr. Note: The sample will shrink back to approximately original size. On a flat, clean surface roll a piece of reusable adhesive into a cylinder with uniform diameter just slightly greater than the thickness of the sample. Lay the reusable adhesive cylinder in an open-ended circle (~25 mm inner diameter with a small opening at the top) on a 40 mm glass bottom dish. If corrections need to be made, remove the cylinder from the glass and cut with a razor blade. Use a p1000 pipette tip to create a seal between the reusable adhesive and glass by rolling it around the outer rim of the cylinder. Place ~100 µl 63% TDE onto the glass dish and spread around to cover the glass surface within the circle of reusable adhesive. Using a spatula, carefully place the sample in the middle of the circle, taking care not to form bubbles. Pipette another 100 µl of 63% TDE directly onto the sample, then immediately place a 40 mm circular cover glass over the reusable adhesive. Using the index, middle, and ring finger of both hands, carefully press around the perimeter of the circle until the cover glass has made contact with the sample. Slowly bring the glass bottom dish to an upright position resting against a surface, then add 63% TDE with a pipette until the solution reaches the small opening at the top. Use a lint free wipe to dry off the pipette tip so that the solution does not drip on the glass. To avoid bubbles in the chamber, never empty the pipette all the way. To the small opening, add silicon elastomer to enclose the circle and create a closed chamber. Wait 5 min for it to dry before imaging. Caution: The lasers used in confocal, single plane illumination and light sheet microscopy are very powerful and can cause blindness. Any experiments utilizing lasers should be performed after extensive training and with great caution and appropriate eye protection. Place the imaging chamber with the sample inside on the stage of a laser scanning confocal microscope. Open the imaging software (see Table of Materials). To turn on the argon excitation laser, click the configuration tab at the top of the program then the laser icon. Check the box next to argon to power the laser and move the slide scale to 30%. Observe the pointer slowly warm up to the selected position. Return to the acquire tab at the top. In the large box "Beam Path Settings" go to the load/save setting box and select the drop down menu to select an appropriate wavelength channel to image YFP (527 nm). Select appropriate objectives for imaging by locating the red hyperlink labeled "objective: current object" under the channel settings box. Clicking on the tab opens all available objectives and a selection will automatically rotate the turret. Use objectives (e.g., 10X) with a large working distance (greater than the thickness of the tissue to be imaged, e.g., 11 mm) and a large numerical aperture (e.g., 0.3) to maximize in-plane image resolution and minimize optical section thickness. On the left column of drop down menus, open the "XY: resolution" window to set acquisition matrix, called "format", to 1,024 x 1,024 or a value appropriate for the lateral resolution limit of the objective. Set the zoom factor as low as possible (e.g., 1.7). In the same window, set 8 line average and 1 frame average parameters by dropping down the individually labeled menus accordingly. Use large values for a high signal-to-noise ratio and small values for rapid acquisition. Note: 8 line averages and 1 frame average will acquire high-quality images of a mouse brain hemisphere in approximately 4 hr. Locate the sample using the stage controls. Once a representative field is visible, set the gain and offset. Note: The gain and offset will vary substantially based on the tissue type, fluorophores, and/or anatomical feature being imaged. For YFP, set values from 760 to 780 for the gain and from -1.0 to -1.5 for the offset. Select "tile scan" and select the boundaries of the region of interest. Set the upper and lower limits of the z-stack to be acquired. Set the thickness of the optical section based on the objective's optical section resolution limit. Note: An objective's optical section resolution limit is defined primarily by its numerical aperture. Most microscope control software will automatically calculate a value appropriate for the objective being used. For a 10X objective with a numerical aperture of 0.3 that would be approximately 11 µm. Note: This may take multiple hours. Collect higher resolution images using higher magnification objectives from specific regions of interest. Visualizing the structural organization of the brain is critical for understanding how morphology and connectivity affect brain function in health and disease. Optical clearing techniques make it possible to image cell populations in 3D in intact tissues, allowing us to study morphology and connectivity cohesively. Mice that express fluorescent proteins driven by promoters specific for sub-populations of cells permit one to tease apart the complex pattern of neural connectivity in the brain. THY1-YFP transgenic mice have been used extensively in the optical clearing literature because these mice express YFP in a subset of projection neurons that reside in the cerebral cortex and hippocampus, as well as other structures in the brain (Figure 2a & b). Furthermore, YFP+ cortical layer V neurons project through the corticospinal tract in the spinal cord (Figure 2c & d), making them very useful in evaluating the effect of axonal insult and/or injury in the spinal cord on cortical neurons15. 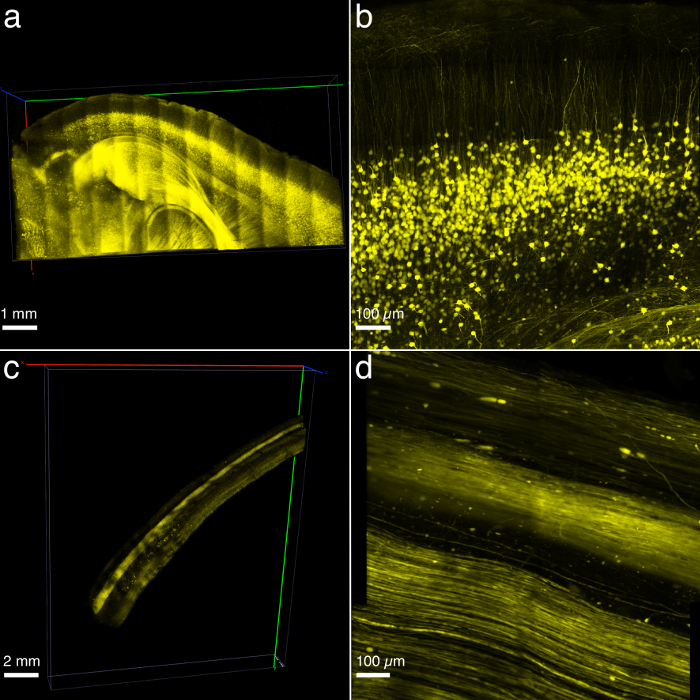 Through the use of confocal microscopy and optical sectioning of optically cleared tissues one can easily evaluate differences in neuronal density across large anatomical structures. In addition to THY1-YFP transgenic mice, any number of transgenic mice can be imaged. PLP-EGFP transgenic mice express enhanced green fluorescent protein (EGFP) in mature oligodendrocytes expressing proteolipid protein (PLP) throughout the brain and spinal cord (Figure 3a). PV-TdTomato transgenic mice express TdTomato in a subset of parvalbumin (PV) expressing interneurons in the cerebellum, striatum and hippocampus (Figure 3b). Even in mice that do not express fluorescent transgenes, small molecular weight fluorescent dyes, such as DAPI, can readily diffuse into hydrogel embedded tissues and permit the evaluation of cellular nuclei in the brain (Figure 4). Figure 1: Different Stages of Brain Clearing. Photograph of THY1-YFP+ mouse brain that has been removed from the skull (a). Photograph of hydrogel-embedded THY1-YFP+ mouse brain hemisphere (b). Photograph of THY1-YFP+ mouse brain hemisphere after lipid removal (c). Scale bars are 5 mm in each panel. Please click here to view a larger version of this figure. Figure 2: THY1-YFP Expression in the Brain and Spinal Cord. THY1-YFP+ neurons in the cerebral cortex and hippocampus imaged at 5X magnification and reconstructed in 3D (a). A maximum intensity projection of a 10X image stack of the cerebral cortex demonstrating the dendritic arborization of cortical layer V pyramidal neurons (b). THY1-YFP expression in an intact cervical and thoracic spinal cord imaged at 5X magnification and reconstructed in 3D (c). A maximum intensity projection of a 10X image stack of the spinal cord demonstrating individual axons (d). Scale bars are 1 mm in (a), 100 µm in (b), 2 mm in (c), and 100 µm in (d). Please click here to view a larger version of this figure. Figure 3: PLP-EGFP and PV-TdTomato Expression in the Brain. PLP-EGFP expression in a 2 mm thick coronal brain section imaged at 5X magnification (a). This image is approximately 1 mm from the surface of the tissue section. 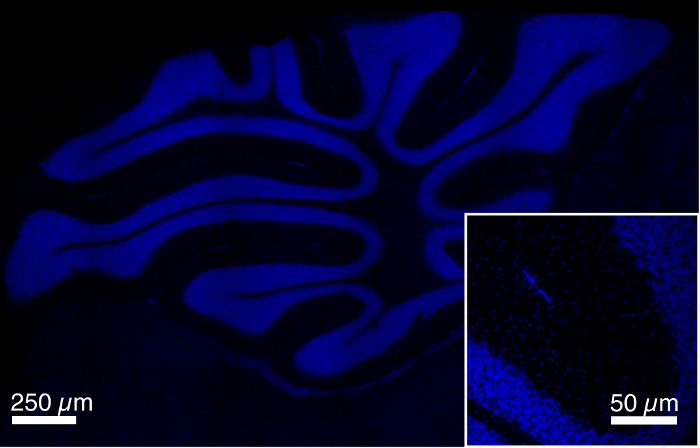 PV-TdTomato expression in the cerebellum of an intact cerebral hemisphere imaged at 10X magnification (b). This image is approximately 0.5 mm from the midsagittal plane. Scale bars are 1 mm in (a) and 250 µm in (b). Please click here to view a larger version of this figure. Figure 4: DAPI Staining in the Brain. DAPI expression in the cerebellum of an intact cerebral hemisphere imaged at 5X magnification. The image is approximately 1 mm from the midsagittal plane. The inset shows the level of detail visible at this imaging depth at 10X magnification. Scale bars are 250 µm in the main panel and 50 µm in the inset. Please click here to view a larger version of this figure. Table 1: List of Buffers and Solutions. Passive clearing of hydrogel embedded tissues (passive CLARITY) is a simple and inexpensive method for clearing large pieces of tissue. This approach does not require dedicated equipment and can easily be performed in a temperature-controlled shaker. Over the span of a few weeks, even large, highly myelinated tissues, such as an entire brain or spinal cord, will become transparent and suitable for microscopy. Even though this report has focused on the clearing of CNS tissues, passive CLARITY can be applied to any tissue. The relative strengths and weaknesses of optical clearing techniques have been discussed previously in the literature13,17,22,, but are most clearly laid out in 23. Passive CLARITY is well suited for experiments where large numbers of samples are being cleared simultaneously and reproducibility is of great importance. The use of a hydrogel to provide additional support to the tissue facilitates multiple probing of the tissue. In this report, a small molecular weight dye, DAPI, was demonstrated, but multiple rounds of antibody probing are also possible with this approach. The approach described above deviates from our previously published protocol15 in a couple of significant ways. Firstly, in the current approach, the specimens were not intracardially perfused with hydrogel. This was due to the fact that the hydrogel can prematurely polymerize in the tubing and needles of the perfusion apparatus, leading to incomplete perfusions and inconsistent clearing. Incubating paraformaldehyde fixed tissues in hydrogel for 7 days is consistent with the original CLARITY protocol14, though a 1 day incubation is used for 1 - 3 mm thick tissue sections in the PAssive CLARITY Technique (PACT)17. Secondly, this approach performs lipid removal at a slightly higher temperature that previously reported15-17. Higher temperature accelerates lipid removal, but must be balanced against the possibility of a catastrophic loss of tissue integrity (melting). By increasing the incubation temperature by 8 °C (to 45 °C) for 7 days and then by 3 °C (to 40 °C) for the remainder of the lipid removal process, tissue clearing is accelerated, but without the concurrent risk of the loss of tissue integrity. This increase in temperature is consistent with temperatures reported during Electrophoretic Tissue Clearing (ETC) in the original CLARITY protocol (50 °C)14. Furthermore, no decrease in the intensity of transgenically expressed fluorophores nor decrease in DAPI staining has been observed. Deoxygenation is an important step in the creation of the hydrogel. The hydrogel may polymerize in the presence of oxygen dissolved in the hydrogel solution, but in our hands the rate and completeness of polymerization was much more variable without deoxygenation. If the hydrogel does not polymerize, the most common reason is the presence of oxygen in the hydrogel. The optical clearing process is remarkably easy to implement, however, the microscopy that follows may be quite complicated. Of critical importance are the objectives used to image the tissue. The working distance of an objective defines the depth that it can image into a tissue sample. An objective with a working distance of 2 mm can only image 2 mm into a sample, therefore the working distance of an objective must be greater than the thickness of the sample in order to image it completely. Similarly, the numerical aperture of an objective places a limit the size of features that it can resolve both in-plane and the thickness of optical sections that it can meaningfully acquire. Selective Plane Illumination Microscopy (SPIM) and Light Sheet Microscopy (LSM) can overcome the limitation on optical section thickness by the nature of the illumination, but these microscopes are not widely available. High numerical aperture, large working distance objectives are rare and expensive, but are necessary for high quality imaging from large optically cleared sections. Once the images have been acquired, they are often very large, ranging from several hundred MB for a low resolution (both in-plane and the z-direction) image to a few TB for a high resolution image collected on an LSM. The computers used for image analysis require not only a great deal of storage, but large amounts of random access memory (RAM) for image processing. Software packages suitable of the analysis of large optically cleared image volumes include Amira, Imaris, and ImageJ14-16. Among the limitations of this approach, passive CLARITY requires more time to clear tissues than other optical clearing approaches. Decreasing the volume of the tissue to be cleared by trimming it or sectioning it into smaller pieces can accelerate lipid-removal. Also, decreasing the concentration of paraformaldehyde in the hydrogel will in turn decrease crosslinking and increase the hydrogel pore size, leading to more rapid clearing17, though this may lead to greater tissue expansion, individual experimenters may find that it is worth the decrease in clearing time. Further, combined with TDE as a clearing agent, the amount of overall tissue expansion may be limited. Though this report describes the use of small molecular weight dyes, antibody probing is a very natural next step. The presence of the hydrogel not only provides physical support to the cleared tissues, but also serves as an impediment for the penetration of antibodies deep into the tissue. Decreasing the acrylamide concentration or the paraformaldehyde concentration will increase the pore size in the hydrogel, facilitating (and thus accelerating) antibody penetration17, but this has a deleterious effect on tissue expansion. Nevertheless, antibody probing of blocks of tissue can be accomplished in a matter of days and whole brain in a couple of weeks using the acrylamide and paraformaldehyde concentrations described in the original report14. Optical clearing techniques allow one to look deeply into the brain, furthering the understanding of its structure and function. These new tools will enable researchers to visualize the brain at cellular and molecular resolutions, increasing our comprehension of this most complex of organs. This work was generously supported by the National Institutes of Health/National Institute of Neurological Disorders and Stroke (NIH/NINDS) grant 1R01NS086981 and the Conrad N. Hilton Foundation. We thank Dr. Laurent Bentolila and Dr. Matthew Schibler for their invaluable assistance with confocal microscopy. We thank those that have contributed to the CLARITY forum (http://forum.claritytechniques.org). We especially thank Dr. Karl Deisseroth for opening up his lab to teach this fascinating technique. The authors are grateful for the generous support from the Brain Mapping Medical Research Organization, Brain Mapping Support Foundation, Pierson-Lovelace Foundation, The Ahmanson Foundation, Capital Group Companies Charitable Foundation, William M. and Linda R. Dietel Philanthropic Fund, and Northstar Fund. Research reported in this publication was also partially supported by the National Center for Research Resources and by the Office of the Director of the National Institutes of Health under award numbers C06RR012169, C06RR015431, and S10OD011939. The content is solely the responsibility of the authors and does not necessarily represent the official views of the National Institutes of Health. Micheva, K. D., Smith, S. J. Array tomography: a new tool for imaging the molecular architecture and ultrastructure of neural circuits. Neuron. 55, 25-36 (2007). Kleinfeld, D., et al. Large-scale automated histology in the pursuit of connectomes. J Neurosci. 31, 16125-16138 (2011). MacKenzie-Graham, A., et al. A multimodal, multidimensional atlas of the C57BL/6J mouse brain. J Anat. 204, 93-102 (2004). Denk, W., Svoboda, K. Photon upmanship: why multiphoton imaging is more than a gimmick. Neuron. 18, 351-357 (1997). Denk, W., et al. Anatomical and functional imaging of neurons using 2-photon laser scanning microscopy. J Neurosci Methods. 54, 151-162 (1994). Zipfel, W. R., Williams, R. M., Webb, W. W. Nonlinear magic: multiphoton microscopy in the biosciences. Nat Biotechnol. 21, 1369-1377 (2003). Helmchen, F., Denk, W. Deep tissue two-photon microscopy. Nat Methods. 2, 932-940 (2005). Theer, P., Denk, W. On the fundamental imaging-depth limit in two-photon microscopy. J Opt Soc Am A Opt Image Sci. Vis. 23, 3139-3149 (2006). Dodt, H. U., et al. Ultramicroscopy: three-dimensional visualization of neuronal networks in the whole mouse brain. Nat Methods. 4, 331-336 (2007). Erturk, A., et al. Three-dimensional imaging of solvent-cleared organs using 3DISCO. Nat Protoc. 7, 1983-1995 (2012). Ke, M. T., Fujimoto, S., Imai, T. SeeDB: a simple and morphology-preserving optical clearing agent for neuronal circuit reconstruction. Nat Neurosci. 16, 1154-1161 (2013). Chung, K., et al. Structural and molecular interrogation of intact biological systems. Nature. 497, 332-337 (2013). Spence, R. D., et al. Bringing CLARITY to gray matter atrophy. Neuroimage. 101, 625-632 (2014). Tomer, R., Ye, L., Hsueh, B., Deisseroth, K. Advanced CLARITY for rapid and high-resolution imaging of intact tissues. Nat Protoc. 9, 1682-1697 (2014). Yang, B., et al. Single-cell phenotyping within transparent intact tissue through whole-body clearing. Cell. 158, 945-958 (2014). Costantini, I., et al. A versatile clearing agent for multi-modal brain imaging. Sci Rep. 5, 9808 (2015). Zheng, H., Rinaman, L. Simplified CLARITY for visualizing immunofluorescence labeling in the developing rat brain. Brain Struct Funct. (2015). Parra, S. G., et al. 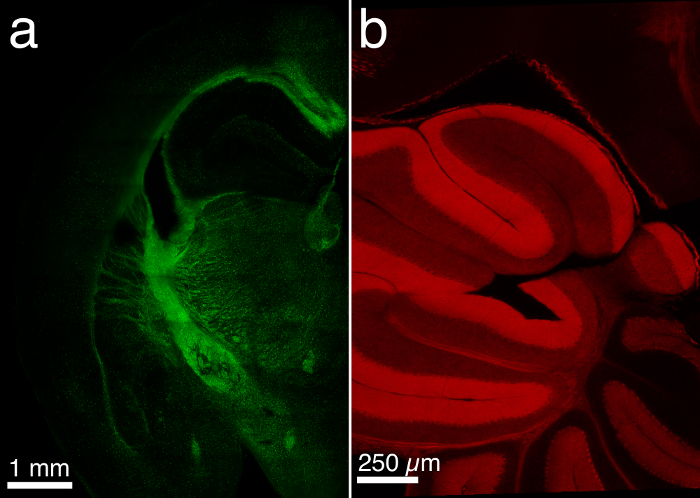 Multiphoton microscopy of cleared mouse brain expressing YFP. J Vis Exp. (67), e3848 (2012). Weinger, J. G., et al. Two-photon imaging of cellular dynamics in the mouse spinal cord. J Viz Exp. (96), e52580 (2015). Hama, H., et al. ScaleS: an optical clearing palette for biological imaging. Nat Neurosci. 18, 1518-1529 (2015). Treweek, J. B., et al. Whole-body tissue stabilization and selective extractions via tissue-hydrogel hybrids for high-resolution intact circuit mapping and phenotyping. Nat Protoc. 10, 1860-1896 (2015).